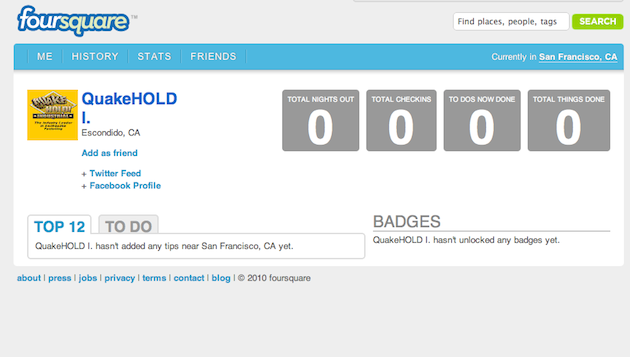 Congratulations QuakeHOLD I. of Escondido, California, you’re Foursquare’s one millionth user. Or, at least, you’re the user with the one millionth ID. Yes, the much talked-about location-based service crossed the milestone today. Yesterday, Foursquare hinted the milestone was coming soon with a tweet saying, “We’re closing in on 1 million users! Current count is 969,775. Looks like that’s we may have something to toast during Friday Happy Hour :).” It looks like the million threshold was crossed sometime in the past few hours, though the company has yet to officially acknowledge it. Foursquare has been gaining users at a rapid clip since the so-called Location War at SXSW in March. During the course of the conference, Foursquare signed up some 120,000 new users in just 10 days. Clearly, they’ve been able to keep up those great sign-up rates, and likely even expand upon them. And during peak times they were approaching 400,000 check-ins a day (which also obviously means that not all users are using it on a daily basis). It took Foursquare just over a year to get to a million users. By comparison, it took Twitter about 2 years to get one million users. Of course now, two years after that, Twitter has over 100 million users. Foursquare, undoubtedly, would love to see that type of growth — assuming they don’t sell first.